It has been 9 years since I became president of Kyoei Golf. 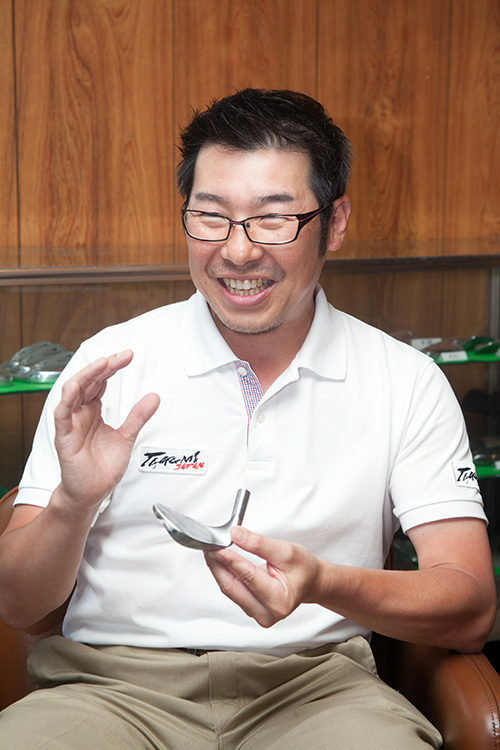 The philosophy of our company which I took over from an original founder, my father, is to become a company which can afford to pay the highest salary to our employees in the golf industry in Japan and continue to improve our skills in traditional forging, grinding, and polishing golf heads. It took a considerable amount of time for me to build a relationship of trust with the employees who used to play catch ball with me when I was little. Because a good relationship with them is the most important thing when producing the products which I want to make without compromise. Also, the golf industry is shifting manufacturing overseas and is improving the distance of a hit ball. Alloy development and the forged iron head have become mainstream technology. We have developed the forged iron, which improves the carry of a golf ball. But, in my personal opinion, the golf iron and wedge are just the tools used by the golfers to hit a golf ball in the place where they aim at. I expect all golfers have the same thought. It has been 60 years since we started our business. Comparing to human life, this year would be Kanreki (the celebration of a person's 60th birthday) and a milestone in our history. Kanreki is also the time when you can restart and take on new challenges. We conducted a review of our corporate philosophy. We will keep implementing new measures in order to develop as a sustainable company. We have been promoting our business mainly for OEMs, but from now on, we'd like to communicate directly with golfers, while at the same time we understand the needs of our customers. We want to make sure that our customers deeply understand our philosophy. We hope that not only golfers in Japan, but also ones all over the world recognize the beauty and significance of Japanese forging and grinding methods and techniques. In order to promote these measures, we are planning to establish a company specialized in marketing. I think that our company's mission is to protect and develop the forging methods which have lasted for a couple of hundred years.